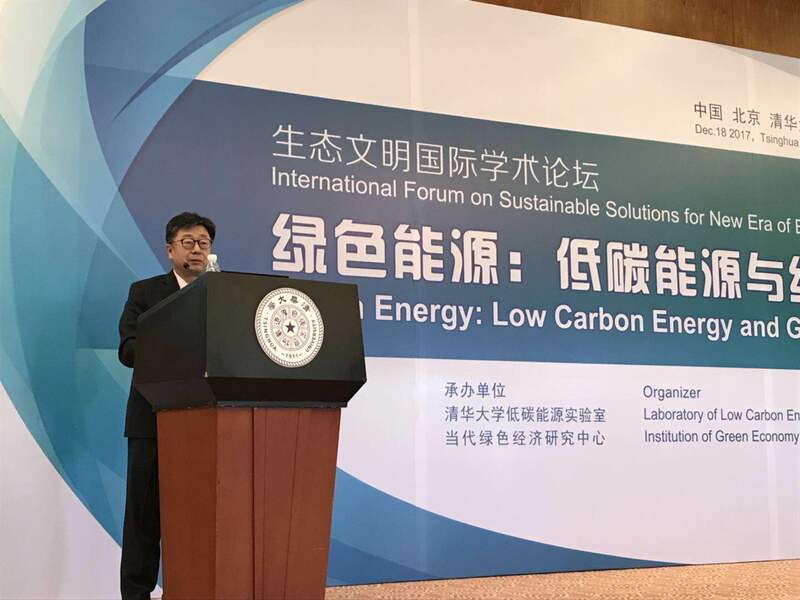 Berkeley Lab's Jiang Lin delivered a keynote speech at the International Forum on Sustainable Solutions for New Era of Ecological Civilization at Tsinghua University on December 18, 2017. Dr. Lin presented research results on potential impacts of electricity market reforms in Guangdong Province from a study by Berkeley Lab's China Energy Group and the Berkeley-Tsinghua Joint Research Center. Researchers from Berkeley Lab, Energy and Environmental Economics (E3), Tsinghua University, and North China Electric Power University joined this research. This study provides the first quantitative assessment of the impacts of electricity market transition in China, focusing on Guangdong Province. This study examines the impact of market reforms on total generation costs and CO2 emissions, as well as the net revenue impacts on individual classes of generators. The study finds that market reforms deliver significant cost savings to consumers in Guangdong, driven primarily by reductions in average revenues for coal generators, fuel efficiency improvements for coal and natural gas generators, and natural gas-to-coal switching. Savings for consumers are accompanied by a large reduction in net revenues for coal and gas generators. Please click the link below to download the presentation. The International Forum on Sustainable Solutions for New Era of Ecological Civilization was hosted by Tsinghua University Center for Ecological Civilization on December 17-18, 2017. The forum provided a platform for academic exchange on the most recent findings on ecological civilization. This forum was composed of a plenary forum and eight sub-forums (i.e. eco-industry, eco-city, green energy, eco-system, eco-culture, eco-protection, green university, and youth forum). More than 500 experts from China and around the globe attended this forum, including Xue Qikun, Vice President of Tsinghua University, Gong Ke, President of Nankai University, and Dietmar Grimm, President of the Paulson Institute.